What does the word "repaint" mean in the sentence below? They will repaint the building. Opaque paint that contains polymers? Thomas has to the new sprayer so it doesn't rust. The girl a picture of her horse. In art class there were 2 boxes of paints on each table. There were 3 tables. There were 8 paints in each box. How many paints were there in all? There are 540 milliliters of red paint. There are 730 milliliters of green paint. How many more milliliters of the green paint is there than red paint? Raphael painted a famous painting called the School of Athens. Which sentences uses correct capitalization? Thomas Gainsborough painted "the blue boy." Choose the sentence that uses the COMMA correctly. Next, you dip the brush in the paint. Next you dip the brush in the paint. Next you, dip the brush in the paint. Next you dip the brush, in the paint. 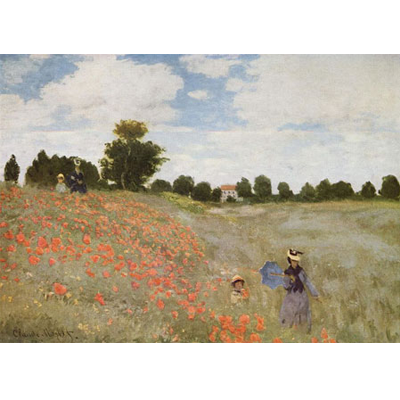 This painting is named "Poppies in a Field". What are the people in the painting doing? Which Renaissance artist painted the famous painting, Mona Lisa? Romare Beardon is an artist who is famous for his work using ?